Example soil boring. Photo courtesy of Barr Engineering. Example of direct push technology used to collect a soil sample. Caution: The MPCA Highly recommends field determination of soil infiltration rates. See Determining soil infiltration rates. If soil borings or soil pits are utilized, it is Highly recommended a certified soil scientist or geotechnical engineer interpret the borings. Knowing the soils in the area of a proposed infiltration best management practice (BMP) helps determine the suitability and design of the BMP. Soils determine how quickly stormwater will infiltrate, affect plant growth, and affect the fate and transport of pollutants. Section 16.10 of the Construction Stormwater general permit states “Permittees must provide at least one soil boring, test pit or infiltrometer test in the location of the infiltration practice for determining infiltration rates”. The Minnesota Stormwater Manual recommends that soil borings or pits be dug to verify soil types and infiltration capacity characteristics and to determine the depth to groundwater and bedrock. This article presents a discussion of soil sampling, soil borings, and interpreting soil information. Caution: Objectives for collecting soil borings for stormwater infiltration practices differ from objectives for collecting borings for structural engineering purposes. Identification of low permeability or restrictive layers in soil is critical to proper design and construction of infiltration practices. In particular see the sections on How to order a soil boring and Restrictive layers in soil profiles. Caution: It is Highly Recommended that soil borings be extended a minimum of 5 feet below the bottom of the proposed infiltration practice and that the most restrictive soil layer be considered in estimating infiltration rate. Warning: The Construction Stormwater General Permit states "Permittees must provide at least one soil boring, test pit or infiltrometer test in the location of the infiltration practice for determining infiltration rates"
This video provides an example of the impact of even thin layers of clay on infiltration. The recommended number of borings is shown in the folowing table. Prior to ordering a soil investigation, it is highly recommended that historical records are evaluated for the site. What other use(s) has the site had? Are historical soil borings available for the site? Could site soils be contaminated? A list of possible site soil constraints and additional information can be found here. This page provides a summary of useful information sources for investigating the history of a site. The more variable the site history, the greater variety of soil types you may expect to find. For example, a rural 1 acre site that has always been farmed will probably have more consistent soils from one location to the next compared to an urban 1 acre site which has had many different uses, including importation of fill materials. An urban site with many previous uses may require a larger amount of soil investigation to properly identify the soil profile. There are several types of soil sample collection methods which can be used to determine soil characteristics. Sample collection methods are listed in the following table from simplest/quickest/cheapest to complex/slower/expensive. The table describes advantages and limitations and provides references and photographs for each of these methods. Of these six types of soil sample collection methods, soil borings are highly recommended. Soil borings provide the greatest amount of data. Knowing existing conditions as a result of proper soil investigation allows the design team to develop an accurate design and cost estimate prior to bidding or construction. Finding unexpected soil conditions during construction can result in time delays and costs associated with modifying the design. Summary of drilling methods to collect soil samples for infiltration basins. Click on an image to enlarge. 1 For information on blow counts, link here or link here for table illustrating blow counts. There are two categories of soil samples, disturbed and undisturbed. A disturbed sample does not retain the in-situ structure of the soil. These types of samples can be used for classification tests such as the grain size analysis which is described in greater detail below. There are generally three types of disturbed samples that can be collected during an investigation. Bulk samples. These can be a small grab sample that fits into a zip-lock bag. Larger samples can be collected in 5- gallon buckets. These samples are usually auger cuttings from the top 5 feet, or taken from an excavation test pit or trench. Split-spoons samples are 1-3/8 inch diameter cylindrical columns of soil obtained using a split-spoon sampler. The sampler is pounded into the soil in three or four 6-inch drives using a driving weight assembly. The number of hammer blows needed to pound the spoon 6 inches in depth is called the blow count and is recorded on the boring logs. The 6 to 12 inch and 12 to 18 inch blow counts are added and recorded as the n-value for that split-spoon. Gravel and cemented soils have high blow counts while clay and soft soils will have low blow counts. Split-spoon samples are taken during a soil boring. This type of sample will give the most relevant information in determining soil suitability for an infiltration BMP. Continuous sampling methods provide a complete record of the soil beneath a drilling site. Samples are usually collected in plastic 5-foot liners. Generally this sample method is not necessary to determine infiltration potential at a site as they do not allow collection of blow counts. Undisturbed samples are recovered completely intact and the in-situ structure and stresses are not modified in any way during collection. Samplers used to collect relatively undisturbed samples include Thin-wall, Modified California, Piston, and Pitcher. Undisturbed samples are generally not collected when trying to determine infiltration potential at a site as they do not allow collection of blow counts. 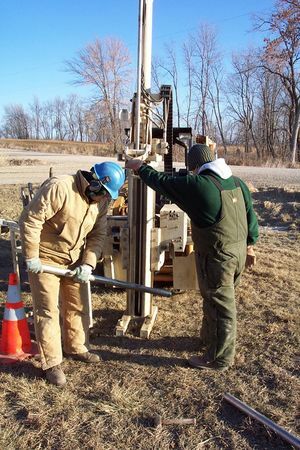 Having a geotechnical engineer/technician (engineer) present during drilling investigations is highly recommended as they specialize in field reconnaissance, coordinating and directing the drillers, logging boreholes, and collecting soil samples. 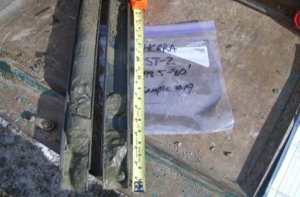 Having an engineer onsite during drilling investigations will cost more initially, but if subsurface information is inaccurate or inadequate, a greater number of assumptions need to be incorporated into the design, which increases the potential for negative impacts later in the design life and/or costly surprises during construction. If recovery in a split-spoon sample is less than six inches, drill two feet deeper and perform another split-spoon sample. If a confining layer is found, or there is low recovery in a split-spoon, reduce sampling intervals to every two feet. Record the presence of the most restrictive layer, even if that material is not the most abundant in the split-spoon sample. If soil boring auger refusal is encountered prior to depth desired, offset approximately five feet from initial borehole, blind -drill (continuous drilling without soil sampling) to refusal depth, and continue drilling/sampling from that point. Note there will be an additional cost associate with the offset and blind drill. If the second attempt results in the same refusal as the first, the driller should call the engineer to inquire about next steps immediately, prior to leaving the site. During that call, ask drillers to describe why they think refusal has been met and, if necessary to drill deeper, discuss alternative drilling methods or an additional offset. Ask the driller to include soil type, recovery, blow counts, and presence of water in their field logs, and request a copy of their field logs. It is highly recommended that the drillers use a standard form (attached). If they do not use a standard form, request to see their form prior to drilling and suggest modifications as necessary. To the extent possible, the final boring logs should contain information listed in the table Summary of Information to Include on a Boring Log (see below). Summary of information to include on a boring log. To enlarge an image, click on the image. Drilling method Record method used or depth where there is any change in the method being used. Different drilling methods may require different sampling techniques or procedures. Drilling methods include: Hollow Stem Auger, Direct Push Technology, Mud Rotary, Rotosonic, Air Rotary, ODEX. Particle shape Can be angular, subangular, subrounded, or rounded. Important for understanding deposition environment and weathering of soil. Layer boundaries and thickness Note stratigraphy breaks on logs. Unless transition is obvious while drilling, assume it is halfway between sampling intervals. Blow Counts The number of hammer blows to pound the split-spoon 6, 12, 18, and 24 inches into the soil. The 6 to 12 and 12 to 18 inch blow counts are added and recorded as the n-value for that split-spoon. "Refusal" or termination of borehole occurs if the hammer does not advance for >50 blows/6 inches. Note the advancement (e.g. 50/2"). Depth to bedrock and/or refusal "Refusal" or termination of borehole occurs if the hammer does not advance for >50 blows/6 inches. Note the advancement (e.g. 50/2"). Note refusal on logs. Note sample recovery if refusal is reached in a split spoon interval. Depth of groundwater Record during and after drilling Note perched layers of water in sand or lignite. Record cave-in depth in unstable boreholes. Note if water isn't encountered. Saturated silts will have high dilatancy. Moisture Provides indication of water table. For each sample identify if it is moist, wet, or saturated. Inclusions Used to describe the secondary components in a soil sample. Topsoil thickness Helpful to know how much topsoil stripping may be necessary. Note organic material if present or not. Photo: Pat Dumas. Creative Commons BY-NC-SA (cropped). Boring logs can be presented vertically or horizontally. Examples of logs for four of the drilling methods previously presented are attached. Note that layer boundaries are well defined on each of these logs making it easy to identify the transition between different soil types. All the information discussed in Table 2 is presented on the logs as well as laboratory testing results. Examples of soil boring logs. Click on an image to enlarge. Note that each of the example logs above utilize the United Soil Classification System (USCS). While this is the most commonly used classification system on boring logs, other systems, such as the United States Department of Agriculture (USDA) classification system, may be used. An example blank form that allows for both the USCS and USDA classifications is shown in the figure to the right (Source: USDA-NRCS). Comparisons between the USCS and USDA classifications are shown in the following table. 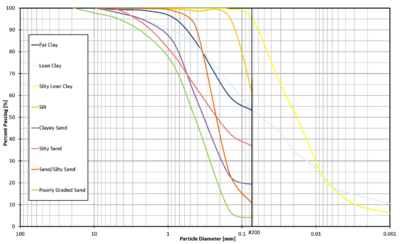 Example of a particle size distribution (PSD) curve, which shows the percentage of soil from a sample passing through a sieve of known diameter. For example, in a sand, only about 5 percent of the sample passes through a 0.1 millimeter diameter sieve, while for a silt, 80 percent pass through. Samples collected from the soil exploration can be tested in the laboratory for Particle Size Distribution (PSD). This test is critical to determining the most limiting soil layer with respect to infiltration. A disturbed or bulk sample is appropriate for this test. The PSD test was developed to classify a soil particle based on its size according to the particle’s ability to pass through a series of standard sieves. A sieve is a carefully manufactured mesh of wires with a specified opening size. The ASTM D2487 standard is the most commonly used for particles retained on the #200 sieve or greater than 0.003 inches (0.075 millimeters) in diameter. A hydrometer analysis can be performed on particles smaller than the #200 sieve following ASTM D422 standard, but is generally not necessary for infiltration analysis. If a large percentage of soil sample particles are passing the #200 sieve, infiltration is not recommended. PSD curves are created from the sieve and/or hydrometer results which provide the information needed to classify a soil and determine if the soil is poorly-graded (does not have a good representation of soil particle sizes) or well-graded (has a good representation of soil particle sizes). An example of a PSD curve is shown to the right. A restrictive soil layer is one continuous layer of soil that impedes the movement of water through it. A restrictive layer will also impede air movement and root growth. Bedrock, frozen soils, dense soils, cemented soils, saturated soils, and a clay layer are examples of restrictive layers. A restrictive soil layer is capable of perching groundwater above the layer. This video provides an example of the impact of even thin layers of clay in soil. Infiltration is limited by the least permeable or most restrictive layer in the soil profile. The Minnesota Construction Stormwater general permit prohibits infiltration in areas with less than three feet of separation distance from the bottom of the infiltration system to the elevation of the seasonally saturated soils or the top of bedrock. Other published guidance found on the California Environmental Protection Agency State Water Resources Control Board website recommends that any restrictive soil layer found within ten feet of the bottom of an infiltration BMP should be evaluated by a Professional Engineer (PE) and approved by the City Engineer. 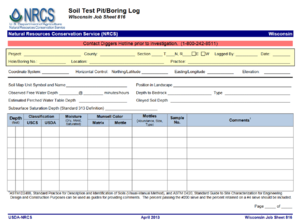 At the end of a soil exploration program, and when the soils collected from the field have been subjected to visual observation and laboratory testing, a soil exploration report is prepared for use in planning and design, clearly summarizing results and providing soil data (including boring logs). A larger exploration program will required a larger report while a smaller program might only be summarized in a short technical memo. The items listed below should be present in both types of reports, but the level of information or detail summarized will vary. Additional information about evaluating site soils can be found in Site Evaluation for Stormwater Infiltration by the Wisconsin Department of Natural Resources Conservation Practice Standards (2004). Information on soil investigations for petroleum contaminated sites include the following. Soil and Ground Water Assessments Performed During Site Investigations. Guidance ocument 4-01. Soil Sample Collection and Analysis Procedures. Guidance Document 4-04. Das, Braja M. 2006. Principles of Geotechnical Engineering. 6th Edition. Cengage Learning, Stamford, CT.
Coduto, Donald P.; Yeung, Man-chu Ronald; Kitch, William A. 2011. Geotechnical Engineering Principles and Practices. 2nd Edition. Pearson, Upper Saddle River, NJ. Terzahi, Karl; Peck, Ralph B.; Mesri, Gholamreza. 1996. Soil Mechanics in Engineering Practice. 3rd Edition. John Wiley & Sons, Inc. This page was last modified on 29 August 2018, at 08:21.